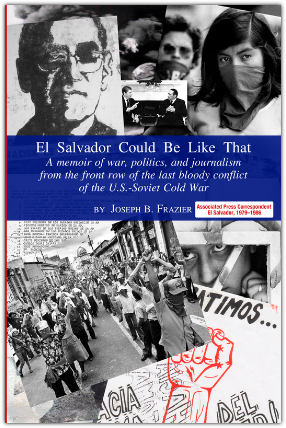 El Salvador Could Be Like That | Joseph Frazier - A war unforgotten - memoir of AP Central America correspondent Joe Frazier of the El Salvador war. ​Both broad in its sweep and intense in its focus on the daily lives of the war's victims, Frazier's book is an important contribution to the scholarship on this mostly forgotten conflict. He explores the war and the factors that contributed to it in the hopes that such horrors will not be repeated. ​Deeply sympathetic to the ordinary people—of all political leanings—who suffered the most, Frazier exposes the daily horrors and injustices of this long, brutal war: death squads, disappearances, stolen children, food shortages, displacement, constant intimidation. Frazier calls upon his vast trove of articles written from the frontlines, interspersing the reporting of facts with personal stories—some funny, some tragic—and political commentary. Read more about. Preview book. "This is so much more than the best journalistic account of the war that enveloped El Salvador in the 1980s. It is an exciting, fast-paced adventure story; an insightful analysis of the way nations break apart; a disturbing look at the war correspondent's life; and above all, a poignant, deeply personal story about a great reporter's efforts to come to terms with what he has seen and experienced." —Stephen Kinzer, International Relations, Boston University, award-winning NY Times foreign correspondent and bureau chief, author of Blood of Brothers: Life and War in Nicaragua and other titles. —Journalist and filmmaker Mary Jo McConahay, author of the National Geographic Book of the Month, Maya Roads: One Woman's Journey Among the People of the Rainforest. "Evoking a distant war that no one should forget. ...Hats off to Joe Frazier for this important book." "Anybody who wants to be a journalist – or a better journalist – will benefit from Frazier’s shining example in this book." The book is available in print editions from the publisher, from Amazon.com, and your local bookstore (ISBN 978-1-937902-09-4). A Kindle edition is also available.